HOW'S THE REAL ESTATE MARKET DOING? The infamous Mortgage Meltdown led to the most epic real estate market crash in modern history. The bottom of that market was February 2009. Market resilience, and good old fashioned supply & demand have created a NINE year run-up in prices, from $320K to $619K. What most people don't realize is this price increase represents a 93% INCREASE since February 2009, or just over 10% per year ... which is PHENOMENAL. Since a typical market will go "UP" in value for about 5-7 years, and since we're now in our 9th year I wonder if we'll possibly level off and stabilize. I'm not entirely sure, but I believe the following two things are the most important to watch: INTEREST RATES and INVENTORY. Right now, rates are starting to come up a little bit, however since inventory is VERY low I'm not sure the rising rates will shut off the market. It's possible if rates come up a little bit then it will help to create a more healthy, and more stable market, because buyers will have more inventory to choose from and the "multiple offers over asking price" scenario which many areas are experiencing right now will trail off a bit ... and this is a good thing b/c no more market can sustain that kind of craziness. 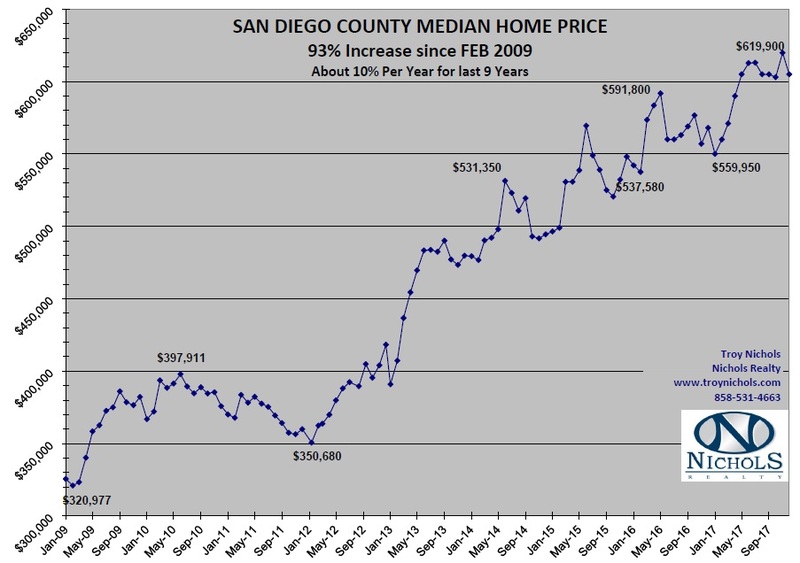 Keep checking this page for the current market conditions in San Diego, and of course if you have any questions give me a ring @ 858.531.4663 or shoot me an email to Troy.NicholsRealty@gmail.com . I'd love to help you with all your real estate & financing needs.